And not forgetting the spring onions. Our garden just got a little more useful with the first carrots of the season. There are plenty more to come and some purple heirloom varieties will be ready soon too. Hey John! Chooks are going great guns – thanks. Just found the white girl sitting today … maybe a little early for me to get some fertile eggs for her though? Anyway, was reading this post of yours and thought I’d ask – do you ever get carrot fly? 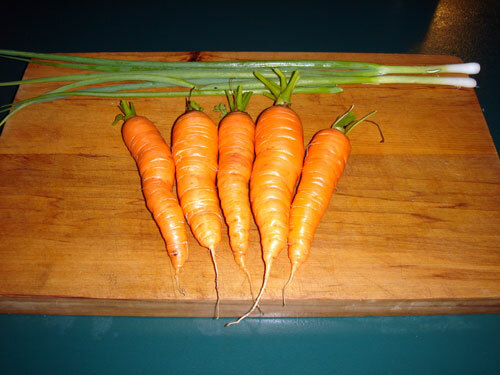 I had a go at carrots this winter and had a bad infestation – not a single unaffected carrot. Interplanted them with onions but it obviously didn’t help. Any tips would be welcome – before I give up entirely!